Coming from the coolest of the classic European wine countries, where grapes ripen slowly, German wine is about much more than just fruit. It’s about balance, mineral freshness, depth of aroma and flavor, and also a miraculous lightness. Exemplified by the finest Rieslings, German wine displays contradictory characteristics of subtlety and intensity that reflect specific aspects of climate, geography, and soil. 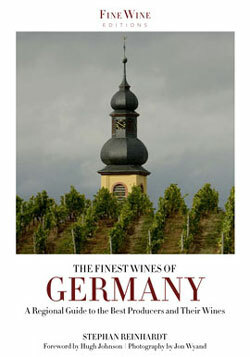 As German wine rises in popularity, this lavishly illustrated and informed guide presents an unrivaled introduction to the country’s primary wine regions and grape varieties, including Riesling, Silvaner, Pinot Blanc, Pinot Gris, and Pinot Noir, as well as wine styles and culture. Stephan Reinhardt profiles 70 leading producers whose personalities, philosophies, and authentic wines best represent today’s exciting German wine scene. 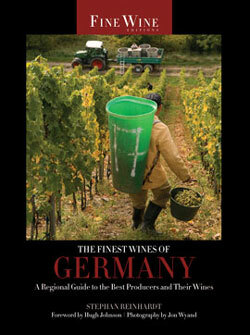 This guide adds greatly to the enjoyment and understanding of German wines by telling more of the story under the vines and behind the wines.